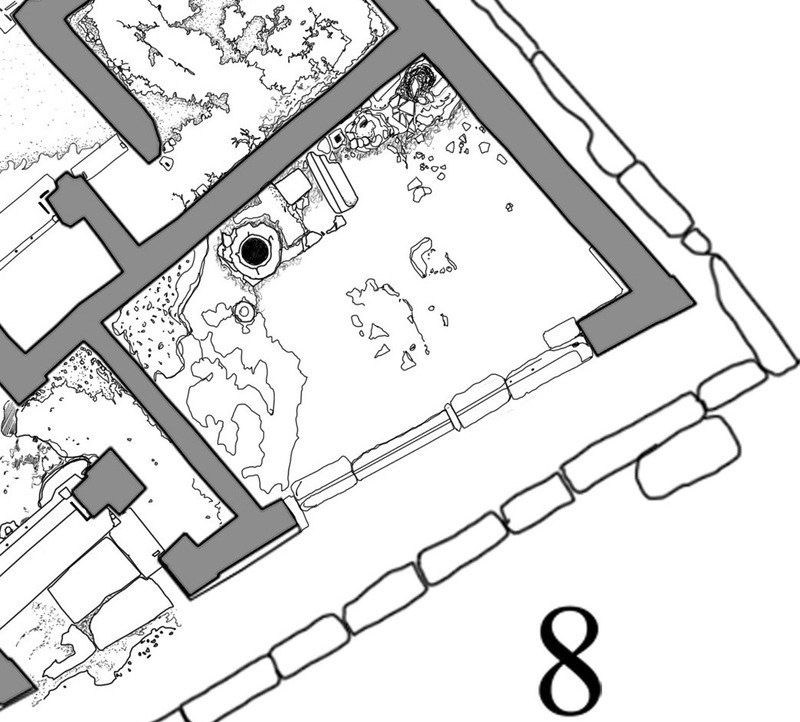 V 1,8 is a small taberna, situated in the south-eastern corner of the insula, opening up towards Via di Nola. It consisted of one room on the ground floor and another room on the upper floor. The existence of this, now lost, upper floor is indicated by beam holes in the east and west wall and a latrina placed in a niche in approx. 4.5 m height in the east wall near the north-eastern corner. The function of this taberna cannot be determined anymore, but several, mostly much damaged features indicate some productive activity. 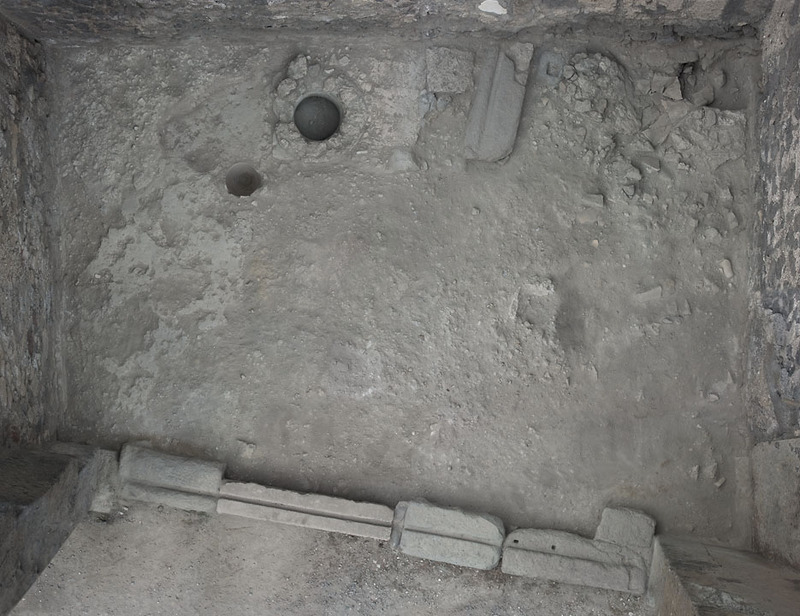 These features consists of a cistern mouth, a rounded structure, maybe the substruction for a work bench and, attached to it a drain running towards a pozzo nero in the north-eastern corner of the room, some remains of a probably square structure and finally the preserved lower parts of an amphora set into the floor near the rear wall. A preserved part of an upper floor coating of lime mortar in the north-western corner of the room, approx. 0.14 m above the general floor level could be remains of the base for the staircase. The ground plan of the room is slightly irregular since the course of the front side is following the course of Via di Nola; the course of the rear wall instead is oriented in a 90ï¿½ angle to the north-south street axes. Since the Via di Nola, the east-west axe is not at right angle with the north-south running streets the result is a slightly trapeziform with the eastern side longer than the western one. This taberna has no connection to the main house of this part of the insula, the casa del Torello, V 1,7 and never seems to have had it. 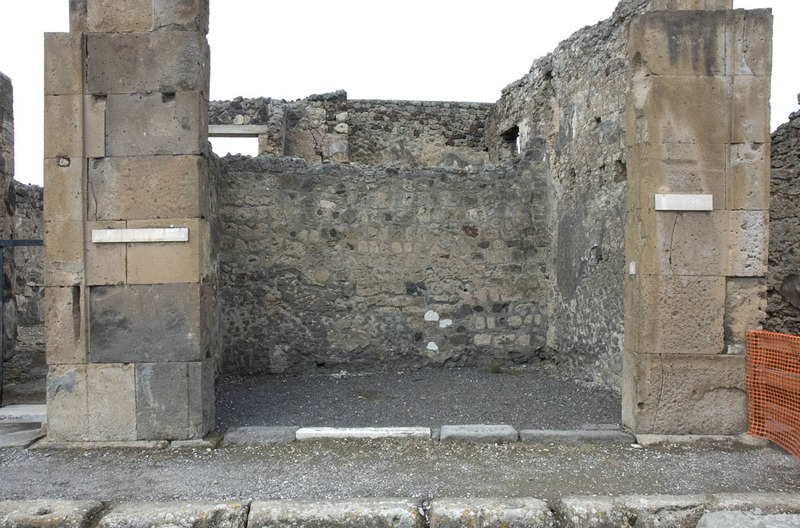 The partition wall between the two entities is in its upper part mostly a modern reconstruction, but it preserves in its lowest layers still enough remains of the original wall to prove, that this wall belongs to the first building phase of the main house and shows no filling up of a later blocked off door. Some changes in the lay-out of this taberna can be observed. In its first phase, probably from the third quarter of the second century B.C. till the middle of the first century B.C. it extended further towards the west. When the owner of the adjacent Casa del Torello built a new side entrance just next to the main one into the atrium, the westernmost part of the taberna was used for the new vestibule. Also the large opening towards Via di Nola seems to have altered at one time, showing that is was slightly widened towards the west. Eventually also one of the blocks of the threshold, which is the only block made of travertine stone was inserted at the same time. On the west and east wall remains of plaster are preserved. The floor seems to have been made of a simple lime mortar. That this taberna originally was larger and its west wall is a later construction is shown by the different building material used for it compared with the material belonging to the original building phase. This wall is built with a much more mixed rubble filling than the earlier one containing nearly exclusively lava in the lower parts and red Cruma in the upper ones. Here also smaller pieces of tuff stone can be observed probably reused material coming from the part of the older wall where the side entrance was broken into the tuff stone part of the wall. Another indication for the later diminishing of V 1,8 can be observed in the west wall of the new side entrance of V 1,7. This wall originally was the west wall of V 1,8, as can be seen by the row of beam holes, which are situated in the same height as the corresponding row on the east wall of V 1,8. Since the vestibule of the side entrance did not have an upper floor, these beam holes were related to the upper floor of V 1,8. Another indication for the non-contemporaneity of the (new) west wall of V 1,8 with its corresponding east wall can be seen in the arrangements made for the support of the floor of the upper room. The original east wall shows a typical solution with a row of holes for the supporting beams, inserted approx. every 0.35 m. These beams the covered the lower room in east-west direction and the probably wooden floor of the upper room was laid out on these beams. On the west wall instead another solution can be observed. Here only two holes can be identified, both placed quite near the south or north corner. They are slightly lower (approx. 0.25 m) than the holes on the east wall. Into these holes cantilevers were inserted, either of wood or of stone. On these two cantilevers a beam was placed parallel to the wall, which in its turn supported the east-west running beams for the upper floor. This arrangement had the advantage, that it could quite easily be used to create a new support for an already existing floor, which during the building work might have been supported by scaffolding.